Hello everyone we are back with a new recruitment notification, with BSF RECRUITMENT NOTIFICATION then here is an opportunity for you. An organization has issued a fresh notification for BSF Recruitment Notification has invited applications through an mode so guys if you are interested in BSF job alert then visit. Educational qualification– Candidate who has successfully completed 10th with ITI or Diploma in from any recognized an institution or boards are eligible to apply these vacancies. Age criteria– Candidates upper age limit should between 18 to 23 Years As on 01-08-2019. is age limit for these posts and candidates who are from reserved category will get age relaxation on an upper age limit as per state government rules and regulations..
Educational qualification– Candidate who has successfully completed Diploma in relevant trade recognized by Directorate General Civil Aviation, Officials under the Central Government or State Governments holding analogous posts, Retired Armed Forces personnel in from any recognized an institution or boards are eligible to apply these vacancies. Age criteria– Candidates upper age limit should not exceed 52 Years (Post 1-6,8-11), 50 Years (Post 7). is age limit for these posts and candidates who are from reserved category will get age relaxation on an upper age limit as per state government rules and regulations.. 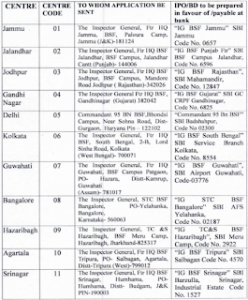 Address – Deputy Inspector General (Estt), HQ DG BSF, Block No. 10, CGO Complex, Lodhi Road , New Delhi, PIN – 110003. Educational qualification– Candidate who has successfully completed 10th with ITI/ Diploma in Civil/ Electrical Engineering in from any recognized an institution or boards are eligible to apply these vacancies. Age criteria– Candidates upper age limit should be between 18 to 25 Years (Post 3-5) is age limit for these posts and candidates who are from reserved category will get age relaxation on an upper age limit as per state government rules and regulations. Fee – For General/OBC Candidates Application Fee is – Rs. 200/- (Post 1,2), Rs. 100/- (Post 3-5) & For All Other Candidates (SC/ ST/ Internal/ Female) Application Fee is – Nil. Pay Scale– After completion of selection rounds, those who will be selected for a job will get a pay Scale Rs. 35,400 – 1,12,400/- (Post 1,2), Rs. 21,700 – 69,100/- (Post 3-5). from department. Selection Process– All form submitted Candidates will Be Selected through Based on Their Performance in Written Exam, Documentation, Physical Standards Test & Physical Efficiency Test. Detailed Advertisement For BSF Recruitment Notification (2). Detailed Advertisement For BSF Recruitment Notification (3). Educational qualification– Candidate who has successfully completed 10th and ITI in respective trade, Three years experience in respective trade in from any recognized an institution or boards are eligible to apply these vacancies. Age criteria– Candidates upper age limit should be between 18 to 25 Years As on 23-07-2018 is age limit for these posts and candidates who are from reserved category will get age relaxation on an upper age limit as per state government rules and regulations. Fee – For General/OBC Candidates Application Fee is – 100/- & For All Other Candidates (SC/ST/Ex-S/Women) Application Fee is – Nil. Pay Scale– After completion of selection rounds, those who will be selected for a job will get a pay Scale Rs. 21,700 – 69,100/-.Grade Pay (For Post 2,3) from department. Selection Process– All form submitted Candidates will Be Selected through Based on Their Performance in Written Test, Physical Standard Test, Physical Efficiency Test, Documentation, Technical Aptitude/Practical/Trade Test, Medical Exam. Important Dates – Desirable Candidates are advised to apply through Offline mode as soon as before 23-July-2018..
Educational qualification– Candidate who has successfully completed 10th / 12th / ITI / Graduation Degree / Diploma (General Nursing / pharmacy) in from any recognized an institution or boards are eligible to apply these vacancies. Age criteria– Candidates upper age limit 21 to 30 Years (Post 1), 18 to 25 Years (Post 2), 18 to 23 Years (Post 3) is age limit for these posts and candidates who are from reserved category will get age relaxation on an upper age limit as per state government rules and regulations. Fee – For General/OBC Candidates Application Fee is – 200/-(For SI/Staff Nurse), 100/- (ASI(PH)) & For All Other Candidates (PH/ST/SC) Application Fee is – Nil. Pay Scale– After completion of selection rounds, those who will be selected for a job will get a pay Scale Rs. 9300 – 34800/- With 4200/- Grade Pay (For Post 1), Rs. 5200 – 20200/- With 2000/2800/- Grade Pay (For Post 2,3) from department. Selection Process– All form submitted Candidates will Be Selected through Based on Their Performance in Written test, Physical Test, Trade Test, Medical Test. Important Dates – Desirable Candidates are advised to apply through Offline mode as soon as before Within 30 Days. Address – The Concerned Headquarters. All candidate can ask us questions relating to (BSF RECRUITMENT NOTIFICATION) by writing in a comment box provided below. We will try to respond as soon as possible.